Discussion in 'Houston Rockets: Game Action & Roster Moves' started by csc177, Sep 22, 2017. I know the focus this offseason has been Carmelo and whether or not the Rockets can form their own version of the Big 3. While I'd like to continuously press F5 for any breaking news like most of us on Clutchfans, I decided to take a step back and take a moment to look at our 23 year old project who I believe is poised to make a huge impact this year. I think CP3 will make Capela a star - similar to the impact he had on Deandre Jordan (who was irrelevant prior to CP3's arrival. CP3 Harden, EG, Tucker, Luc, Ariza, and Clint is a solid squad to go to war with. AND.... if we are "forced" to keep Ryno - his 3 point shooting won't hurt us either - especially since we have some defensive studs to have his back now. Throw Clint's name in the mix for most improved! RudyTBag, roslolian and BigMaloe like this. Did you just make this up? In Paul's 3rd yr, DJ made a jump from 24mpg to 35mpg with no drop in productivity and efficiency per 100 stats. That's what many Centers like Noel and Capela can never achieve,,,and that's why the DJ's are rare. Paul didn't create that All-Star monster. DJ put in the work and built the strength and stamina to do it, himself. 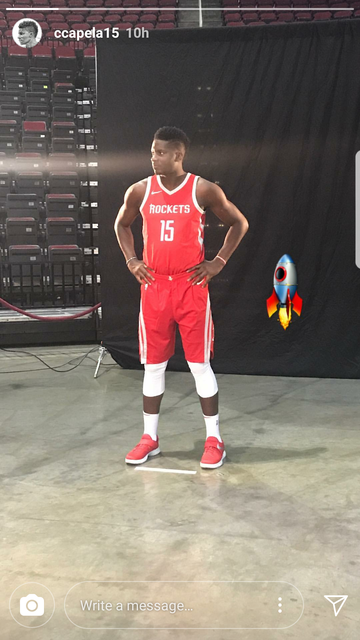 Just like DJ, any improvement will be on Capela himself. He'll never be a star until he can play more than half the game like a real starter, and Paul isnt going to help him get starter minutes any more than Harden could. Capela still only plays 24mpg. The Paul's and Hardens create the 2016-17 Capela's out of just raw talent, basically. But they can't take him to that next DJ All-Star level. That jump is on the player. pippendagimp, Yung-T and BigMaloe like this. Yung-T and DonKnock like this. ASG aside, I don't think Paul had anything to do with turning DJ into a 14 rpg center and one of the top defenders. He still only got 7 fga per game with Paul. He's not some big scorer. Never has been. Yes, that's the new PG for the Clippers. Yung-T and BigMaloe like this. Said it before, he's my favourite player of all time and who I modeled my game after in real life (yea, he's more inspiring than NBA players to me, he's that good and also relatable to Euro kids that don't have the US athleticism). He isn't the best athlete and can be horrible at defense, but pairing him with Bev might actually make a lot of sense and give you a offense/defense mix where Bev defends the better perimeter scorer. Teodosic himself will be able to switch on slower SGs and SFs, or even small PFs. But yes, I don't expect DJ or Griffin to really drop off in production, as Teodosic is the best passer in the world to me and has incredible vision, you'll see passes completely out of nowhere. Some guys here are wetting themselves when the likes of Harden, Rubio, Bron make simple behind the back or through the leg passes, but Teodosic will do some stuff you haven't seen since Magic Johnson and Maravich. He's also a great, albeit streaky shooter, so defenders won't be able to back off and double DJ/Blake, as would be the case with Rubio. Him playing P&R with Blake and DJ will be something to watch. People should really catch some Clippers games next season, every basketball fan will love this guy and realize what the hype is about. ESPN: "McHale has tough job balancing wins and DH's health"
Are we the most athletic team in the League?